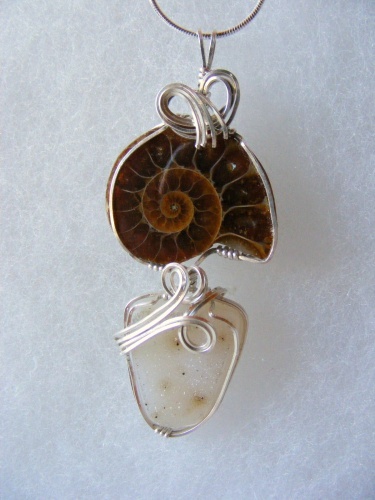 This one of a kind Ammonite fossil and druzy pendant is the most dramatic piece you'll ever own! The brown piece is an ammonite fossil,these creatures lived in the seas between 240 - 65 million years ago, when they became extinct along with the dinosaurs.The bottom gemstone is a sparkling natural druzy with spots of lt brown that beg to accompany the ammonite. You will be the envy of all because of this piece's uniqueness and beauty. Sculpted in sterling silver swirls and accompanied with a sterling silver snake chain. Piece measures 2 3/4" from top of bail to bottom of pendant and 1" at its widest part.